The 2017 FIFA Confederations Cup will take place in Russia one year before they are to host the World Cup. With the World Cup just a year away, that means this year will have the FIFA Confederations Cup. Back in 2013, I did a focus on the Confederations Cup and why it’s an important tournament. This year’s Confederations Cup is important as well. Not just because the Cup is a growing tournament but also for the host country of Russia. Russia is already a country controversial enough with the way they do politics. Hosting next year’s World Cup is also considered controversial as there’s question on how Russia won their bid and FIFA’s process in achieving the victories for both Russia for 2018 and Qatar for 2022. All I can say in this matter is I don’t have the research on that and things will have to sort themselves out over the year’s time leading up to the World Cup. Otkrytiye Arena, Moscow – This will be one of two stadiums in Moscow that will stage the World Cup. Located in the Tushino area of Moscow, this stadium is the home venue for Spartak Moscow. Completed in 2014, this stadium seats just over 45,000 people. Krestovsky Stadium, Saint Petersburg – This 68,000-seat stadium may have just broken ground this year but it took ten years to complete. Problems from construction management to changing contractors to problems with its conditions have plagued the stadium and its construction but it will finally be ready for the Confederations Cup. Built on Krestovsky Island, the stadium is also the host venue for the football team FC Zenit. Kazan Arena, Kazan – Completed in 2013, this 45,000-seat stadium has the largest outside screen in Europe. The stadium has hosted events like the 2013 World Student Games and the 2015 World Aquatics Championships. The stadium is also the home venue for Russian Premier League team Rubin Kazan. Fisht Olympic Stadium, Sochi – Remember the $51 billion Sochi Winter Olympics? This is the host stadium which hosted the ceremonies and held the Olympic flame. Determined not to have it become a ‘white elephant,’ the stadium is now the home venue for Russian Professional Football League team FC Sochi. In addition, it will also host six World Cup games next year. -Russia (63): Russia is an enigma in football right now. The team has a lot of talent but constantly misses in delivering in major tournaments and qualifying events. Such examples include qualifying for three World Cups since the USSR dissolved and failing to qualify for the knockout round each time. Another example is the Euro tournament: semifinalists in 2008 but out in the Group Stage in 2012 and 2016. Trying coaches from other countries like Guus Huddink and Fabio Capello have delivered sub-par results. Russia has yet to prove its current team since Euro 2016. The team consists of a Russian coach and all but one of the lineup for the Cup play for teams in the Russian Premier League. 2017 has not been the best to Russia as they lost 2-0 to the Ivory Coast and drew 3-3 against Belgium and 1-1 against Chile. They did however score a 3-0 win against Hungary. Remember that football is a box of surprises as Pele always says and Russia could end up surprising everyone here. -New Zealand (95): New Zealand can be either a very good team or a bad team. It qualified for the 2010 World Cup and drew in all of its games. However it hasn’t made much of an impact since. The current line-up of the all-blacks only features one player that plays for a team in a major European League (France’s Ligue 1). The Kiwis have been dominant against teams from Oceania but have struggled against teams from other continents such as a 1-1 draw against the US and losses to Belarus, Northern Ireland and Mexico. If they don’t go far here, they can always learn in time for next year. -Portugal (8): Portugal is a team of surprises. The team went from lackluster group play in Euro 2016 to becoming Cup champions. Portugal has since maintained its reputation as one of the best teams in the world with excellent play in World Cup qualifying and continuing to win most of their games. However they have had some notable losses such as a 2-0 loss to Switzerland in September and a 3-2 loss to Sweden in March. Portugal can either be very on or very off here in Russia. The next two weeks will decide their fate. -Mexico (17): Mexico has always been seen as the leader of the CONCACAF. They hope to take it even further by proving themselves among the best in the world. However it’s come at a struggle as they’ve ended their last six World Cups in the Round of 16. Mexico have had a lot of good wins in the last 12 months to teams like Ireland, Iceland and Costa Rica and even had a 1-1 draw against the US. However they’ve had a 2-1 loss to Croatia and a 7-0 loss to Chile at the Copa America. The World Cup may be one year away but now is a good chance for Mexico to prove itself on the world stage. Prediction: This is a tough one but I predict the two qualifiers to the semis to be Mexico and Portugal, but don’t count out a possible surprise from Mother (?) Russia. -Cameroon (32): Cameroon have been one of the most consistent African teams. However their play in the last two decades have been far from their glory days in the early 90’s. The team has worked hard to become better and more consistent since the embarrassment of the 2014 World Cup where they finished dead last. The current squad has many players from many leagues. The team hasn’t had the best chances at proving themselves since. In the past twelve months, they’ve either won or tied every game, but they’ve all been against African teams. The Confederations Cup is a chance for them to prove themselves and where they stand. –Chile (4): We can have a long discussion about the ‘sleeping giants’ in football waiting for their big moment to arrive. Chile would be one of them. They have been underestimated in the past and have even gone out in the Round Of 16 in the past two World Cups; and to Brazil both times. However Chile has seized the moment at both the 2015 and 2016 Copa Americas by winning their first-ever Copas. Chile now wants to prove its greatness on the world stage, but they have had an up-and-down period since Copa 2016. They’ve had wins against Uruguay, Colombia and Iceland, but they’ve also had losses to Romania and Argentina and even drew against Russia 1-1 just a week ago. Chile will have to seize the moment if they want to prove themselves further. –Australia (48): Since Australia was switched from the Oceania federation to the AFC after their Round of 16 surprise at World Cup 2006, bigger and better things were anticipated from them. Instead it’s been the opposite with losing in the Group Stage these past two World Cups. Australia hopes to put itself back as a powerhouse. However they’ve had a mixed bag of results in the past twelve months ranging from a 1-0 win against Greece to a 4-0 loss to Brazil. Anything can happen here in Russia and Australia could possibly find itself among the frontrunners. -Germany (3): The current holders of the World Cup appear to be the heavy favorites to win here. They’ve maintained a consistency even with new members added to the national team ever since. However they’ve had their difficulties too. The semifinal loss at Euro 2016 showed they still have some elements of team unity and other glitches to work on. Since Euro, Germany have not had a loss. They’ve had wins against England and the Czechs but have also drawn 0-0 against Italy and 1-1 against Denmark. They have what it takes to win the Cup here. They just have to deliver. Prediction: Long shots can pull surprises but I’m going to go with my best instincts and predict Germany and Chile to be this group’s two qualifiers. And there’s my look at the confederations Cup and the competing teams. Winner to be decided on Sunday July 2nd. Possible more blogs to come, depending on how many hits I get with this. Will France win for the third time? Or Portugal for the first time ever? How about that? What started on the 10th of June with 24 teams will end on the 10th of July deciding which team will win the 2016 European Championship. It took this whole time 50 matches to decide the two teams most worthy to play for the Championship. On Sunday, it will come down to Portugal and hosts France. The big question is who will win it? Before I get to head-to-head stuff, I’ll do some finals stats. France has been to the Euro finals twice before and won both times, including when they hosted in 1984. Portugal has been to the finals only once before back in 2004 when they hosted and lost to underdogs Greece. And to think back then it featured a rising 19 year-old by the name of Cristiano Ronaldo. The two have squared off 24 times before. France has won 18 times, Portugal five times and one draw. France’s most recent win over Portugal was 1-0 in a friendly nine months ago. The last time Portugal beat France was all the way back in 1975. PORTUGAL: Just a small tidbit of trivia. Two players from Euro 2004 –Cristiano Ronaldo and Ricardo Carvalho– are here in Euro 2016. Also a piece of irony: you know how Portugal lost to Greece in the 2004 Euro final? Well coach Fernando Santos coached the Greek team at the 2014 World Cup. Unlike 2004, Portugal come to the finals as the underdogs. And it’s easy to see why. All three of their Group Play games were draws. Their Round of 16 match against Croatia was won thanks to an extra time goal. Their quarterfinal against Poland was a 1-1 draw which Portugal luckily won on a flawless penalty shootout. They didn’t fully come alive until their semifinal against Wales which they won 2-0. It’s obvious Portugal has shown some of their weaknesses. Hungary was good at exploiting them during their 3-3 draw. Portugal should consider themselves lucky they were able to score three goals during that match too. Portugal has a lot of strengths too. They have two good strikers in Cristiano and Nani. They have a rising young star in 18 year-old Renato Sanches. They’ve also delivered more goal attempts than France. They’re a team that knows how to attack. Their defense needs to be as consistent as it was during their match against Wales if they want to win the Championship because the French are the highest-scoring team in the tournament. This will make for an interesting final of Cristiano Ronaldo vs. Antoine Griezmann. FRANCE: No member of France’s Euro-winning squad of 2000 is playing for France now. However the team is coached by Didier Deschamps who was the captain of the Euro-winning 2000 squad and was part of the 1998 world Cup winning squad. For the most part, this trip to the Championship has been a dream for France. Save their scoreless draw against Switzerland, the French have been the class of the field. They’ve played like a strong team unit and have defended strongly too. They have a star striker in Antoine Griezmann but don’t forget Olivier Giroud and Dimitri Payet. They look like they’re on fire to win France’s third Euro title. It’s not to say France has weaknesses, though they have hardly been exposed. One thing is that France has had less ball possession in some games. While that doesn’t prove much of a fact for those games, that could be a factor in the final as Portugal also has strikers who know how to score. France has even been contained by the other teams at times, including Albania who kept them scoreless until the 90th minute. Sure, Portugal has slacked off for most of the tournament but they could just surprise France on home turf when they least expect it. My Verdict: Eventually I will have to predict a winner for the final so here goes. I predict France to win 3-1. They’ve been delivering the most and giving the least away. So I have to go with them. If they do, France would also become the first country to win the Euro twice as host nation. No nation has won even the World Cup twice as host. Here’s an interesting note. Whichever team wins the Euro will represent Europe in next year’s Confederations Cup in Russia. Already six of the eight berths have been decided. Russia qualifies as hosts, Germany qualifies as World Cup winners, and Australia, Chile, Mexico and New Zealand qualify upon winning their Confederation’s respective championship. Africa decides their winner in February next year. However Sunday will decided which team will represent UEFA next year. And there you have it. My breakdown and my prediction. So Sunday will answer all your questions. Who will win it? Will France be only the third nation to win a total of three Euros? Or will Portugal become the tenth country to win a Euro? It will all be decided in the Stade de France that night. This is one head-to-head scenario where I don’t have much to compare. Wales only once played Portugal all the way back in 2000. Portugal won. Portugal: Portugal has been an enigma at this tournament. They’ve been very successful in making their way to the semifinals but they’ve grazed the bar almost each and every time. One important fact for this Euro: Portugal is the only semifinalist that has not had a single win in regulation time. All three of their group games were draws, their Round of 16 win against Croatia game after a single goal from Quaresma in added extra time, and their quarterfinal win was thanks to a penalty shootout. Even star Cristiano Ronaldo has faced some flack for underplaying. He should be thankful his two goals against Hungary were what Portugal needed to stay alive in the tournament. If Portugal expects to win the semifinal, they will have to come together and play solid. They can’t afford to take it easy or give things away. Not while Wales has been performing while other teams have slacked off. Wales: Two of the biggest Cinderella teams at this Euro have been Iceland and Wales. In fact the Euro 2016 can best be remembered as the tournament where Gareth Bale finally came to prominence in international play. He’s one of only five players here that has scored three or more goals. In addition to Bale, other teammates had moments to shine too like Ashley Williams, Aaron Ramsey and the currently-unsigned Hal Robson-Kanu. In fact the whole team has performed as a solid unit winning matches over teams with bigger clout like Slovakia, Russia and especially #2 ranked Belgium 3-1 in the quarterfinals. Who decides these FIFA rankings anyways? Wales does have its imperfections. In fact it faced a heated battle against Northern Ireland in the Round of 16 and was only lucky to advance thanks to an auto goal scored by Gareth McAuley: the only goal of the match. In short, Wales have proven themselves able to deliver. However it’s a matter of them all being there. My Verdict: With no reliable head-to-head stats to base a judgement, I have to base it on the team’s play during the Euro. I predict Wales to win 2-1 in added extra time. They’ve both faced each other off twelve times ever. France has won six times, Germany four and two draws. Germany’s wins have been one home, three away. France’s wins have been three home, three away. Germany’s last win over France was at the 2014 World Cup quarterfinals. France’s last win over Germany was during a friendly in Paris in November 2015. Germany: Germany faced a lot of expectations here at the Euro. They came as the reigning World Cup holders who were struggling to form a new team with new younger talent. They’ve done very well for the most part as they won 2-0 against Ukraine and 1-0 against Northern Ireland. Their big moment came in the Round of 16 when they beat Slovakia 3-0. Remarkable since Slovakia beat them 3-1 in a friendly one month earlier. This Euro has also been the arena where Germany’s weaknesses have also been exposed. First was the 0-0 draw against Poland in the Round of 16. The second came against Italy in the quarterfinals. It wasn’t simply drawing 1-1 but their three misses in the penalty shootout right during the first five. Usually Germany are the experts at penalty kicks going without a miss in a major tournament since 1982. That was a shock! Had Italy not also had three misses in their first five, it would’ve been the Italians heading to the semis instead. The German team here in Euro 2016 is very capable of great play and have gone beyond most people’s expectations. However they cannot give anything away while playing against France. Not while France is host nation and playing brilliantly. France: France is one team that has been on a roll consistently. They’ve only had a single draw: 0-0 against Switzerland in the Group Stage. Everything else has been a win: 2-1 over Romania, 2-0 over Albania, 2-1 over Ireland and 5-2 over Iceland. They even have the three highest scorers: Antoine Griezmann with four, Olivier Giroud with three, and Dimitri Payet with three. Having Didier DesChamps, captain of France’s 1998 World Cup winning team, as coach definitely has a lot to do with it. France have been excellent though they aren’t perfect. The team has definitely risen to the occasion game after game and showed all of Europe they’re ready to win at home. They have not had a single loss in 2016. However they could face the pressure of playing at home. Sure, they may have beaten Germany in a friendly in Paris seven months ago but Germany may have something up their sleeve. Don’t forget Germany did a reversal on Slovakia. Also keep in mind Germany beat France 1-0 in the quarterfinals in Brazil as Des Champs was coaching. Some food for thought. TRIVIA: The world was horrified on Friday November 13, 2015 when six bombs went off in various areas of Paris. The first attack was at 9:20pm just outside the Stade de France; right while the friendly between France and Germany was taking place. In fact the two explosions can be heard on video replays during the 16th minute and 19th minute of that game, which continued on and France won 2-0. My Verdict: There’s no one ‘wonderteam’ at this Euro but I think France is the team that most has it together. I think they will win 1-0. And those are my predictions for the semifinals for Euro 2016. I may be right. I may be wrong. All to be decided Wednesday and Thursday. The Copa America has actually been contested longer than the World Cup. Since 1916 to be exact. The biggest football tournament is the FIFA World Cup, right? The second-biggest men’s tournament is UEFA’s Euro, right? What’s the third-biggest? I don’t know either but I think the Copa America should be it. Here, it’s almost like a continental tournament the way the Euro is, adding in two CONCACAF teams. However knowing that the tournament consists mostly of South American teams should draw big football interest. Here we’re talking about a continent that has won nine of twenty FIFA World Cups and continues to show some of the top football prowess in the world today. The Copa America actually began fourteen years before the World Cup. The first competition was actually called the Campeonato Sudamericano de Football. It was contested in Argentina on July 2 and July 17, contested in two stadiums in Argentina and featured four teams competing: hosts Argentina, Brazil, Chile and Uruguay. The competition was decided strictly on round robin play between the four teams. The game results became that the final match, Argentina vs. Uruguay would be a contest to decide the Championship. Argentina needed a win and nothing less because of winning one game and tying another while Uruguay could afford to draw to win the Championship. A scoreless draw is what happened and Uruguay was the first ever Championship winner. During that time the president of the Uruguayan Football Federation proposed that a continental federation be founded. On July 9, 1916, Argentinian Independence Day, the CONMEBOL was founded. Funny how while Europe and North America were fighting in World War I, South America made advances for football competitions. The Championship was actually to be a yearly event and except for 1918 because of a flu epidemic in Brazil, it was an annual event until 1928. More countries would be added including Paraguay, Bolivia and Peru. However because of the creation of the World Cup and a bitter rivalry between Uruguay and Argentina, the Championship was no longer an annual event. It would then take a six-year break between 1929 and 1935 and re-emerge either bi-annually or irregularly such as two competitions in 1959. The inclusion of the Copa Libertadores that year affected how those saw the Championships. The last Championships were held in 1967 but the idea of returning a continental championships for the CONMEBOL countries was still under consideration at the time. In 1975, the Copa America was born. There was no fixed country as round robin games were contested throughout the continent over a period of five months. Only the ten CONMEBOL countries competed and it consisted of round robins, two semi-finals, two finals and a grand final. The continental champion would earn a berth to the upcoming FIFA World Cup for the first and only time. Since then all previous continental championships have been official recognized as Copa Americas. The Copa America would have its growing pains over the next two decades. It was originally to be a quadrennial event and the format from the 1975 tournament would continue to be the norm where competitions would be scattered throughout the countries and a grand final held in a country other than the finalists’. In 1987, the Copa would then be contested in a single host country. It was held in Argentina that year consisting of three groups of three. The winners of the three groups would qualify for the semifinals with the defending Copa champions automatically earning a semifinal berth. In 1989, the Copa changed to a bi-annual event and was held in Brazil. The Copa consisted of First Round group play of two groups of five. The Top 2 from each group would move to the Second Round of additional round robin play to decide the Copa winner upon play statistics. That would continue to be the format in 1991. In 1993, the Copa underwent a new format that currently exists today. The Copa held in Ecuador would be the first ever Copa to include two invitees from the CONCACAF countries of North America, Central America and the Caribbean nations. There would be three groups of four with a maximum of one CONCACAF invitee per group, quarterfinals, a semifinal and a final to decide the Copa winner. The event would continue to be bi-annual until 2001 when the next Copa was played in 2004. It would be tri-annual only temporarily until 2007. Since then, the Copa is slated to be a quadrennial event like the Euro except for a commemorative Copa America to be contested in the United States next year to commemorate the event’s centennial. Here’s something to take note of. As I’ve said in past blogs, sometimes it’s harder for a team to win a continental championship than it is to win the World Cup. Brazil has won eight Copas but the country that has won the most is Uruguay with a total of 15 including the last Copa America in 2011. Argentina has won fourteen. Countries that have never won the World Cup like Colombia, Bolivia, Paraguay and Peru have won a Copa America. Actually a total of seven countries have won the Copa. No country outside the CONMEBOL has won a Copa but Mexico has been a finalist twice. Host country Chile has never won the Copa: one of three CONMEBOL countries that have never done so. They’ve been runner-up four times but they’re hoping to win for the first time ever this year. The winner of this year’s Copa America will represent the CONMEBOL at the 2017 Confederations Cup in Russia. So there’s some additional pressure here. -Chile (16): Well, Chile is host this year. It’s actually a good time since Chile is experiencing one of its best eras in football. Chile is actually one South American country long overdue for a major international win. It’s been runner-up to the Copa four times: they’re one of only three CONMEBOL countries never to have won the Copa. Its best World Cup finish was third back in 1962 which they hosted. Nevertheless this could be their competition as anything can happen in football. They’ve had some good plays since the World Cup where they were ousted by Brazil once again. They still face a tough rivalry with Brazil as they lost to them in a March friendly 1-0. Other friendly results include ties with Mexico and Bolivia, a 2-1 loss to Uruguay and wins over Peru and Venezuela. But they also include losses to Iran and Uruguay. Nevertheless football is a game of surprises and they could just do it if they play right. -Mexico (22): Mexico is the sleeping giant of football. A country loaded with talent but still waiting for their big breakthrough. The last World Cup didn’t help because they lost their Round of 16 match against the Netherlands on a controversial note. An interesting note: ever since the Copa America has allowed invitees from the CONCACAF to play starting back in 1993, Mexico has qualified every time. Mexico could pull an upset as the first ever non-CONMEBOL country to win the Copa. They’ve had a great 2015 with wins over Ecuador and Paraguay but they’ve also had a loss to the United States back in April. Mexico could be the big surprise of this Group and possibly the whole tournament. -Ecuador (34): The 21st century has definitely been good to Ecuador. They never qualified for a World Cup during the 20th century but this century has given Ecuador berths in three of the four World Cups. Copa America success is a different story as they’ve failed to advance past the first round in all four Copas this century. Their best Copa finish ever is fourth-place finishes in 1959 and 1993. The team is full of talent as they have five players playing in Europe and three in Mexico. However they’ve had a rocky 2015 as they’ve lost to Mexico and Argentina. Chile will be another proving point for them. -Bolivia (92): Bolivia is an on-again off-again team in terms of success. They’ve played in three World Cups: the last being in 1994. They have won the Copa before in 1963 as hosts and was runner-up when they hosted again in 1997. They’ve had greats before like Luis Cristaldo and Erwin ‘Platini’ Sanchez but their team lacks the depth they’ve had. Most of the team plays for Bolivian teams or for lesser celebrated European teams. Whatever the situation, this Copa should be a meet where the Bolivians learn to improve themselves en route to the next World Cup. My prediction for this group is that Mexico will top it with Chile in second. Third will be Ecuador. Instead of predicting if the third-place team will be the wildcard qualifier, I’ll just leave it with a third-place pick. That wraps up my first blog of the Copa America. Like the next two, I will just predict group finishes and wait until further into the tournament to predict the eventual Copa winner once each team’s performance give indications which ones have the edge. More on Tuesday. BONUS: Also you’re in for a treat. I have included a Spanish translation of my blog courtesy of Google Translate! BONUS: También estás de enhorabuena. He incluido una traducción al español de mi blog cortesía de Google Translate! ¿El torneo de fútbol más importante es la Copa Mundial de la FIFA, verdad? ¿El segundo mayor torneo de los hombres es de la UEFA Euro, verdad? ¿Cuál es la tercer mayor? Yo tampoco lo sé, pero creo que la Copa América debe ser la misma. Aquí, es casi como un torneo continental de la forma en que el euro es, añadiendo en dos equipos de CONCACAF. Sin embargo, sabiendo que el torneo se compone principalmente de los equipos sudamericanos deben atraer el interés de fútbol grande. Aquí estamos hablando de un continente que ha ganado nueve de veinte Copas Mundiales de la FIFA y continúa para mostrar algunas de las proezas de fútbol más importantes del mundo en la actualidad. La Copa América comenzó en realidad catorce años antes de la Copa del Mundo. La primera competición se llamaba en realidad el Campeonato Sudamericano de Fútbol. Se disputó en Argentina el 2 de julio y 17 de julio, impugnada en dos estadios en la Argentina y contó con cuatro equipos que compiten: los ejércitos de Argentina, Brasil, Chile y Uruguay. La competición se decidió estrictamente en juego del round robin entre los cuatro equipos. Los resultados de los juegos se hicieron que el partido final, Argentina vs Uruguay sería un concurso para decidir el campeonato. Argentina necesitaba una victoria y nada menos porque de ganar un partido y empatar otro, mientras que Uruguay podía permitirse el lujo de sacar para ganar el campeonato. Un empate sin goles es lo que pasó y Uruguay fue el primer ganador del campeonato. Durante ese tiempo el presidente de la Federación Uruguaya de Fútbol propuso que se fundó una federación continental. El 9 de julio de 1916, Día de la Independencia argentina, la CONMEBOL se fundó. Es curioso cómo, mientras que Europa y América del Norte estaban luchando en la Primera Guerra Mundial, América del Sur hizo avances para las competiciones de fútbol. El campeonato fue en realidad ser un evento anual y con excepción de 1918 a causa de una epidemia de gripe en Brasil, fue un evento anual hasta que se añadirían 1928. Más países incluyendo Paraguay, Bolivia y Perú. Sin embargo, debido a la creación de la Copa del Mundo y una amarga rivalidad entre Uruguay y Argentina, el Campeonato ya no era un evento anual. Luego tomaría un descanso de seis años entre 1929 y 1935 y re-emerger ya sea dos veces al año o irregularmente como dos competiciones en 1959. La inclusión de la Copa Libertadores de ese año afectó cómo los vio a los Campeonatos. Los últimos Campeonatos se celebraron en 1967, pero la idea de volver a los campeonatos continentales de los países CONMEBOL todavía estaba bajo consideración en el momento. En 1975, la Copa América nació. No había ningún país fija como juegos del round robin fueron impugnadas en todo el continente en un periodo de cinco meses. Sólo los diez países de la CONMEBOL compitieron y consistieron en round robin, dos semifinales, dos finales y un gran final. El campeón continental ganaría un puesto para la próxima Copa Mundial de la FIFA por primera y única vez. Desde entonces todos los campeonatos continentales anteriores han sido reconocidos como oficial de Copa América. La Copa América tendría sus dolores de crecimiento en los próximos dos decenios. Fue originalmente para ser un evento cuatrienal y el formato del torneo 1975 seguirían siendo la norma en competiciones estarían dispersos por los países y una gran final que tuvo lugar en un país distinto de los finalistas. En 1987, la Copa y luego se disputó en un solo país de acogida. Se llevó a cabo en la Argentina ese año que consiste en tres grupos de tres. Los ganadores de los tres grupos calificarían para las semifinales con los campeones defensores de la Copa ganando automáticamente una plaza en semifinales. En 1989, la Copa cambió a un evento bianual y se llevó a cabo en Brasil. La Copa constaba de Primera Ronda de juego en grupo de dos grupos de cinco. El Top 2 de cada grupo se trasladaría a la Segunda Ronda de juego del round robin adicional para decidir el ganador de la Copa en las estadísticas de juego. Eso seguirá siendo el formato en el 1991. En 1993, la Copa se sometió a un nuevo formato que actualmente existe en la actualidad. La Copa celebrada en Ecuador sería la primera Copa de incluir dos invitados de los países de la CONCACAF de América del Norte, América Central y los países del Caribe. Habría tres grupos de cuatro, con un máximo de un invitado de la CONCACAF por grupo, cuartos de final, una semifinal y una final para decidir el ganador de la Copa. El evento seguirá siendo semestral hasta el año 2001 cuando la próxima Copa se jugó en 2004. Sería trianual sólo temporalmente hasta 2007. Desde entonces, la Copa está programado para ser un evento cuatrienal como el Euro a excepción de un conmemorativa Copa América que se disputará en Estados Unidos el próximo año, para conmemorar el centenario del evento. Aquí hay algo para tomar nota. Como he dicho en blogs anteriores, a veces es más difícil para un equipo para ganar un campeonato continental de lo que es ganar la Copa del Mundo. Brasil ha ganado ocho Copas pero el país que ha ganado la mayoría es Uruguay con un total de 15 incluyendo la última Copa América en 2011. Argentina ha ganado catorce. Los países que nunca han ganado la Copa del Mundo como Colombia, Bolivia, Paraguay y Perú han ganado una Copa América. En realidad, un total de siete países han ganado la Copa. Ningún país fuera de la CONMEBOL ha ganado una Copa, pero México ha sido finalista en dos ocasiones. País anfitrión Chile nunca ha ganado la Copa: uno de los tres países de la CONMEBOL, que nunca lo han hecho. Han sido finalista cuatro veces, pero que están esperando ganar por primera vez en la historia de este año. El ganador de la Copa América de este año representará a la CONMEBOL en la Copa Confederaciones 2017 en Rusia. Así que hay un poco de presión adicional aquí. Chile (16): Bueno, Chile es sede de este año. De hecho, es un buen momento ya que Chile está viviendo uno de sus mejores épocas en el fútbol. Chile es realmente un país de América del Sur desde hace mucho tiempo para una importante victoria internacional. Ha sido finalista de la Copa de cuatro tiempos: son uno de los únicos tres países CONMEBOL nunca han ganado la Copa. Su mejor resultado en la Copa del Mundo fue tercero en 1962 que se organizó. Sin embargo esto podría ser su competencia como cualquier cosa puede suceder en el fútbol. Han tenido algunas buenas jugadas desde la Copa del Mundo donde fueron expulsados ​​por Brasil, una vez más. Ellos todavía se enfrentan a una dura rivalidad con Brasil, ya que perdió a ellos en un amistoso 1-0 de marzo. Otros resultados incluyen amistosas relaciones con México y Bolivia, una derrota por 2-1 a Uruguay y victorias sobre Perú y Venezuela. Pero también incluyen las pérdidas a Irán y Uruguay. Sin embargo el fútbol es un juego de sorpresas y que sólo podría hacerlo si juegan bien. México (22): México es el gigante dormido del fútbol. Un país lleno de talento, pero a la espera de su gran avance. El último Mundial no ayudó porque perdieron su ronda de 16 partido contra los Países Bajos con una nota polémica. Una nota interesante: desde que la Copa América ha permitido a los invitados de la CONCACAF para jugar a partir en 1993, México ha calificado cada vez. México podría tirar una sorpresa como el primer país no CONMEBOL para ganar la Copa. Han tenido un gran 2015 con triunfos sobre Ecuador y Paraguay, pero también han tenido una pérdida para los Estados Unidos en abril. México podría ser la gran sorpresa de este Grupo y posiblemente todo el torneo. Ecuador (34): El siglo 21 sin duda ha sido bueno para el Ecuador. Nunca se clasificaron para la Copa del Mundo durante el siglo 20, pero este siglo ha dado literas Ecuador en tres de las cuatro Copas del Mundo. El éxito de la Copa América es una historia diferente, ya que han fallado para avanzar más allá de la primera ronda en las cuatro Copas de este siglo. Su mejor final de Copa siempre es el cuarto lugar acabados en 1959 y 1993. El equipo está lleno de talento, ya que tienen cinco jugadores que juegan en Europa y tres en México. Sin embargo han tenido una rocosa 2015, ya que han perdido a México y Argentina. Chile será otro punto de prueba para ellos. Bolivia (92): Bolivia es un en-otra vez de nuevo fuera del equipo en términos de éxito. Han jugado en tres Copas del Mundo: la última de ellas en 1994. Ellos han ganado la Copa antes en 1963 como anfitriones y fue subcampeón cuando acogido de nuevo en 1997. Han tenido grandes antes como Luis Cristaldo y Erwin ‘Platini ‘Sánchez, pero su equipo carece de la profundidad que han tenido. La mayoría del equipo juega para los equipos bolivianos o para los equipos europeos célebres menores. Sea cual sea la situación, esta Copa debe ser un encuentro donde los bolivianos aprenden a mejorarse a sí mismos en el camino a la próxima Copa del Mundo. Mi predicción para este grupo es que México superará con Chile en la segunda. En tercer lugar será Ecuador. En lugar de predecir si el equipo de tercer lugar será el calificador comodín, sólo voy a dejarlo con un tercer puesto de recogida. Que envuelve mi primer blog de la Copa América. Al igual que los dos siguientes, me limitaré a predecir acabados de grupo y esperar hasta más lejos en el torneo de predecir el eventual ganador de la Copa una vez que el rendimiento de cada equipo da indicaciones cuáles tienen el borde. Más el martes. As you can tell, I’ve been excited about the Women’s World Cup coming. It was a long time in anticipation. This was actually the last weekend before the World Cup is to begin this Saturday in Edmonton. With it came the Trophy Tour concluding in Burnaby. I had the good fortune to visit that afternoon. 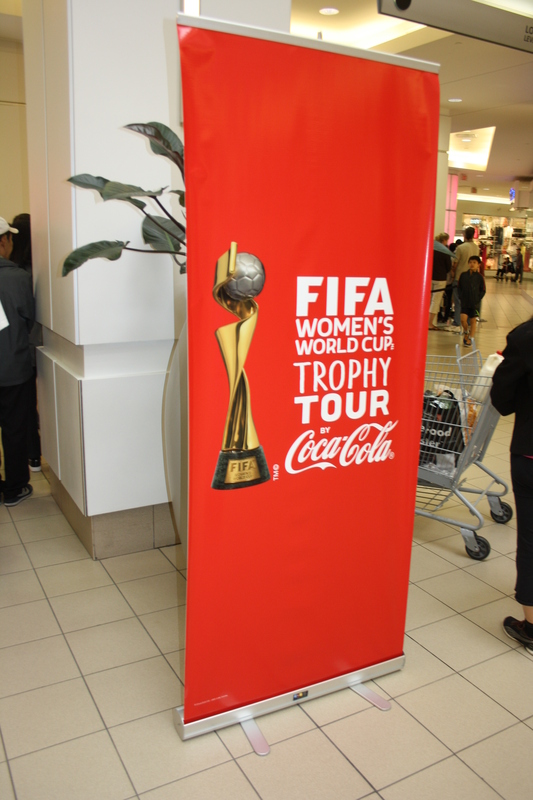 The FIFA Women’s World Cup trophy tour was a tour that happened in twelve cities across Canada including the six cities that have the venues for the Cup. The purpose was to showcase the World Cup encased in glass. The tour also allowed for other things too like a chance to learn more about FIFA’s goals in women’s football and to learn more about the Cup and its 24 years. There were also games and giveaways as well as music and an appearance from the mascot Shueme. The final stop of the journey was Vancouver. The event took place at Burnaby’s Metrotown: the biggest shopping mall in all of Greater Vancouver. Sunday morning was my one free chance I had to go see it. I’m glad I did. A week or two ago, I saw something from the Coca-cola web page on the tour saying there tickets through Ticketmaster available. At that time, I instantly thought you needed a ticket to see the trophy. I agreed to a ticket. They came at no cost so I really lost nothing. I arrived at the area in Metrotown where the event was supposed to take place–the lower level where Toys ‘R Us and T&T Groceries are– and I saw the line up. Most didn’t have a ticket. It wasn’t really needed. It may have helped for some getting to see the Cup sooner but it wasn’t needed. For kids too impatient to wait in line, there was a foosball table in the outside area. Meeting with mascot Shueme made the wait in line easier. I actually forgot my ticket at home so I ended up waiting in line. I arrived at 10:55: five minutes before the event was to begin. I could see volunteers setting up. I could see Shueme in the waiting area. Then at 11am it all began. Music was playing and the line was actually moving faster than I thought. Shueme actually left the event area and was walking around the Metrotown concourse including around the outside foosball table. Yes, they had a foosball table out in case people got too bored waiting. Fortunately she came around where I was standing. I told the volunteer I hope to get a picture with her when she returns to inside. The volunteer actually offered to take the picture right there. It was great. 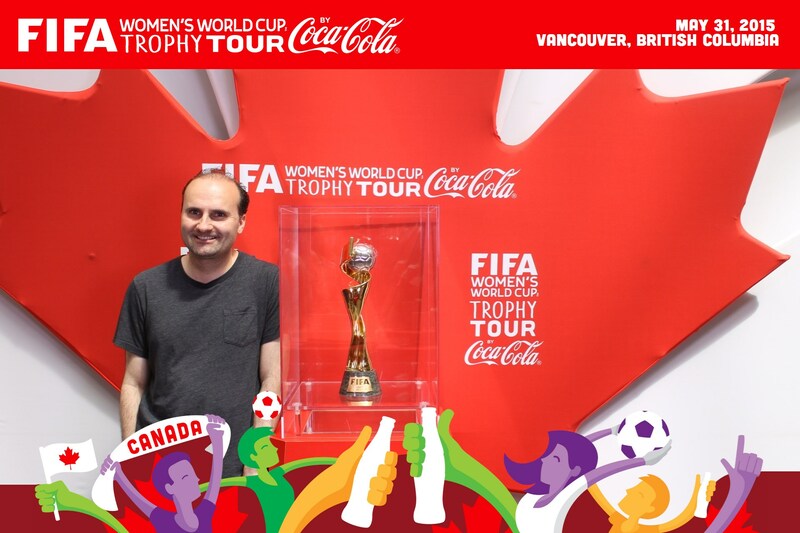 Here I am with the Women’s World Cup! It wasn’t even half an hour of a line up when I finally had the chance to see the Cup. However just before I got in, I saw there was a separate line up for the virtual goalie. I’ll talk more about that later. The exhibit could only have so many people at once so they had to group people: those seeing the Cup, those in the Winners Tunnel who were next in line and those in the waiting area. The waiting area was there to keep us entertained while we were one step closer to seeing the Cup. There was one section that looked like a dressing room but it had jerseys commemorating past Cup champions. As well as there were pads that had WWC trivia. There was also a DJ spinning music with the official ball, the conext15, on display. Then came the Winners Tunnel. This was the section for those about to see the Cup. In there, people waited for about five minutes. Nevertheless we were treated to a video with scenes from the previous World Cup and even clips from the qualifiers. Then it finally came to our turn to see the Cup. It was encased in glass and there were already cameras set up so we can have a custom portrait for sharing. Just go to the website and key in the code. I think mine turned out well. Finally of course with Coca-Cola hosting the event, people were treated to a free Coke in a commemorative aluminum bottle. I have mine as a keepsake. That’s the virtual goalie, controlled by motion sensors that make the split-second decision of which angle to block the shot. Not everything was about the Cup. 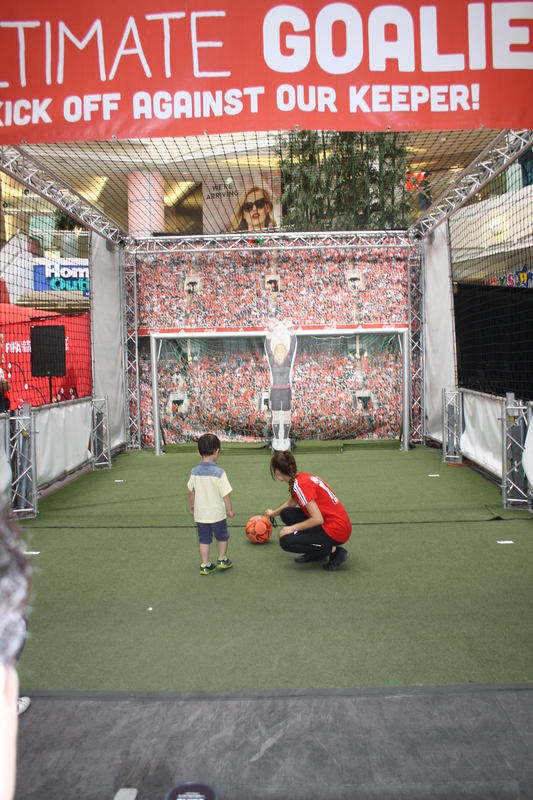 Some wanted to try their luck at the Ultimate Goalie. How does it work? First it involves the participant doing a penalty kick into a net smaller than usual. Secondly the goalie is placed right in the middle of the goal post. Successful penalty kicks win a free commemorative shirt. The thing about this goalie is that it’s on a semicircle of 180. What controls the goalie are motion-sensor cameras that are able to detect how fast the ball is going and what direction it’s headed. The computers are programmed to position the goalie at the right angle to stop the shot. This was very smart and very fast. I remember seeing a couple of shots taken that were very fast and she was able to stop it. I took a shot at it and she even stopped mine. Fortunately for me, there were two people that said I delivered a good shot. I’m not over the hill yet! As for the goalie, I would not be surprised if I see that as a carnival game anytime soon. Good luck in trying to win! For a long time I was hoping to get a ticket. For the last few days I was hoping to get a ticket for a certain Round of 16 game. However I wondered if it would be too expensive. Not just because of the price but the ticket processing fee and tax added on. I wanted a second class ticket for that event but thought maybe it’s better I got third class. Glad I waited because just as I was in line to see the Cup, I heard that tickets were 30% off that day. By the time I was done seeing the Cup, I was ready to order my ticket. Yes, there was a bit of a line up for buying it and very often it was a case of families buying tickets together because of discounts for groups. Sometimes it took a family ten minutes or longer to have their order finalized. Finally it was my turn and I knew what I wanted as I was eyeballing that seat on Ticketmaster the past few days. Knowing what I wanted and where only made me wait five minutes. There was a bit of card trouble at first but I finally got it: a second-class Round of 16 ticket that was originally billed at $75 I bought for just under $62. It was worth it! Now I just have to wait to see if Canada’s playing as one team slated to play is the first-place team of Group A. I’ll be shocked if it’s not Canada! 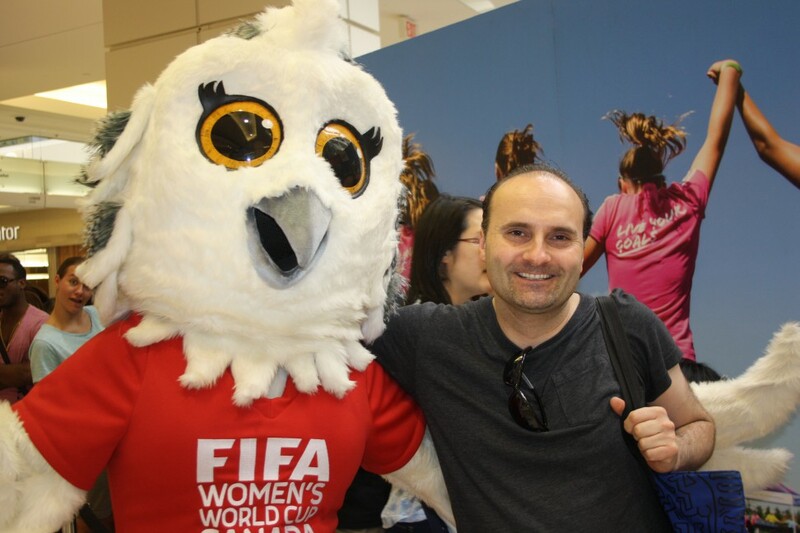 And there you go: my visit to the 2015 FIFA Women’s World Cup Trophy Tour. It was fun and a bit tiring but it was worth it in the end.